In Archetype, an if expression can be provided for any value. The expression variant of the if statement, instead of taking embedded statement clauses, takes value expressions for its "consequence" clauses. Enumerations are represented syntactically like lists in Archetype, using the square brackets to enclose values. The idea is that an enumeration type is simply a list of possible values. Enumerations are often formatted to display one value on each line. The following example demonstrates this, and defines a variable of the enumeration’s type. Regardless of whether you’re working with named or anonymous enumerations, assignment is the same. The enumeration type is not used in the assignment, which works well with anonymous enumerations since they don’t have a discoverable name. Language services (Intellisense) can still inform the user of the possible values after the equals sign and space are entered. The nullable type operator converts a type T to Nullable<T>, the same as in C#. Consider the following examples of normal and bindable nullable properties, and a local variable with an initializer. Additionally, we can define a local variable and infer its type from an assignment, using the nullable type operator to force type inference to use a nullable type. // give me a nullable type, even though I’m not setting it to null no? From this point on, we can assign values (including null) to the Age variable without using the null type operator. In fact, including the ? operator would be invalid. A tuple is an anonymous type consisting of an ordered set of heterogeneous fields. In Archetype, their fields can be named for Intellisense hinting when used as return types, or left unnamed. In local variable definitions, their individual members must either be named or use the anonymous member symbol, the underscore. The following example shows the syntax for defining a tuple as a return type for a function. In this case, a pair of int values will be returned. The members of a tuple in a return type can be named as a hint to the caller of the function. Here we’re defining a new tuple type, Tuple<int, int>, which is not named as a whole. We might call it an anonymous tuple. Instead of naming the whole, we’re naming the individual members. We would then have to reference loc.Item1 and loc.Item2 to access the individual members. Naming the members instead of the whole, however, makes more sense because it provides greater code readability. This next example demonstrates how tuples can be defined using type inference. On the first line, a and b are defined as accessors into a new tuple: a is assigned to a value of 1, and b to a value of 2. On the second line, another tuple is defined and its member c is assigned to a while d is assigned to b. The third line demonstrates how you can use the tuple members independently of each other. In this case, the value of b is assigned to x. If we don’t care about all of the members of a tuple, we can use the underscore character to ignore that member. The next example shows how to extract the x value from our GetMouseLocation function while ignoring the y value. Finally, we have a handy way of swapping values without the need to introduce a third variable. Archetype is not limited to two-member tuples. The .NET Framework defines tuples up to seven members, so Archetype will handle at least that many. If that proves inadequate, it should be relatively easy to extend this to any number of members. I first read about streams (or lazy lists, as in Haskell) in a C Omega document on a Microsoft Research site. They’re analogous to sequences in XQuery and XPath, and are implemented using the IEnumerable<T> type in an iterator. I liked C Omega’s * operator to define a stream because of the way it sets that type apart from a normal type. In C#, it’s not obvious that a function with a return type of IEnumerable<T> should behave any differently from another function until you notice the yield keyword. We can be even more terse in such cases by using a comma in the yield list. One note about the list comprehension here: we don’t use square brackets around the numeric range because they are implied in the yield statement. Including them here would cause the yield statement to return the list as a single yielded value. These examples produce streams with a fixed number of elements, but streams can be infinite as well. This example returns all positive odd numbers starting with one. Streams are lazy, so while it looks at first glance like an infinite loop from which you’ll never escape, in reality control is driven by the loop that accesses the stream. When other type operators are used, such as the nullable type operator, the stream operator must appear last. Archetype provides some special syntax for constructing lists called list comprehensions. This is syntactic sugar that provide shortcuts for building lists. Consider the following syntax in C# and Archetype for constructing a list from 1 to 100. Here you can see how a list can be used as the source of a query. One of the gems in Pascal is subrange types. This allows a developer to define a new type that is structurally the same as another type, but whose values are constrained in some way. I’m often bothered by the disparity between database and .NET types. In a database, a string type (such as varchar) has a definite and usually small limit. In .NET, strings can be up to 2 MB, but there hasn’t been a good way in languages like C# and Visual Basic to constrain the length. In various object-relational mappers, a Size attribute is often employed, but this is only metadata and does nothing to prevent the string from becoming too large, so additional work must be carefully performed to constrain the input using control properties and validation logic. If a type is unlikely to be reused, we can also define subrange types anonymously. In fact, any list comprehension can be used in a subrange type expression, including multiple ranges, as long as a single base type is used. This example shows an age property that is valid for underage and retiring age people, but is invalid for any ages in between. By using a limited number of named string types, both in your code as well as in the database, it’s much easier to update the lengths as needed with a lot less effort. Archetype adds attributes to the members using these types as well, so this data can be queried and used to inform user interface controls and validation logic, enabling a stronger model-driven approach. The length of strings doesn’t need to be a single number representing the maximum, however. We can also specify a range of lengths. As with type constraint expressions—discussed in the next section—Archetype injects the appropriate runtime checks in the property setter before any explicitly specified setter code, and throws an OutOfRangeException if the value doesn’t match the specified type criteria. Related to subrange types, type constraints can be applied equally to named or anonymous types. They allow you to specify a Linq-like where clause that will be used to check values being assigned to properties at runtime. Because they rely on property setter methods, type constraints cannot be used on fields. Fortunately, local variables within methods are also implemented like properties by default, so type constraints are also valid on local variables. I’ve noticed that for some brands, or some stores carrying those brands, only even-numbered sizes of pants are stocked. This example shows a subrange type representing pants size, using both a subrange type as well as a type constraint expression. Using the modulus operator to obtain the remainder of division, we can be certain now that values of this type will only be even numbers. Type constraint expressions are allowed to call static or global functions, properties, and fields, but they cannot reference instance members. This article covered a lot of type fundamentals. It should be obvious at this point how a common thread is being woven into the Archetype language. You’ve probably noticed how almost every construct has named and anonymous counterparts. Another important theme is the ability to extend types with syntax designed to shape them, and the use of Linq-like expressions throughout the language. There is still some type content to cover, such as variant or tagged union types and duck typing, which I’ll save for a future article. Also coming soon is my work on defining custom query comprehensions for a Linq-like query language which can be easily extended with a simple language feature, as well as operators for higher-order functions like fold, map, and others. Work on my goal of getting a basic Archetype compiler into everyone’s hands is going slowly but steadily. I have a simple Silverlight IDE running in the cloud that parses Archetype code and will return a .NET assembly. I got the Oslo tools to work on the server, and I’m partially building the AST I need to perform the semantic analysis and use to report compile errors to the user and to generate the C# code which I’ll then compile with csc.exe. I’m using a WCF publish-subscribe pattern to initiate a build from the client and report progress as messages going back to the client. In the next few weeks for sure, and possibly sooner, I’ll post a link to that so you can give Archetype a test drive yourself. After working in Visual Studio for the past decade, I’ve accumulated a broad spectrum of ideas on how the experience could be better. From microscopic features like “I want to filter Intellisense member lists by member type” to recognition of larger patterns of conceptual organization and comprehension, there aren’t many corners of the IDE that couldn’t be improved with additional features—or in some cases—a redesign. To put things in perspective, consider how the Windows Mobile platform languished for years and become stale (or “good enough”) until the iPhone changed the game and raised the bar on quality to a whole new level. It wasn’t until fierce competition stole significant market share that Microsoft completely scrapped the Windows Mobile division and started fresh with a complete redesign called Windows Phone 7. This is one of the smartest things Microsoft has done in a long time. After many years of incremental evolution, it’s often necessary to rethink, reimagine, and occassionally even start from scratch in order to make the next revolutionary jump forward. Integrated Development Environments have been with us for at least the past decade. Whether you work in Visual Studio, Eclipse, NetBeans, or another tool, there is tremendous overlap in the set of panels available, the flexible layout of those panels, saved workspaces, and add-in infrastructure to make as much as possible extensible. I’ll focus on Visual Studio for my examples and explanations since that’s the IDE I’m most familiar with, but there are parallels to other IDEs for much of what I’m going to cover. Visual layout is one thing that IDEs do right. Instead of a monolithic UI, it’s broken down into individual components such as panels, toolbars, toolboxes, main menus and context menus, code editors, designers, and more. These components can be laid out at runtime with intuitive drag-and-drop operations that visually suggest the end result. The panels of an IDE can be docked to any edge of another panel, they can be laid on top of another panel to create tab controls, and adjacent panels can be relatively resized with splitters that appear between panels. After many years of refinement, it’s hard to imagine a better layout system than this. The ability to save layouts as workspaces in Expression Blend is a particularly nice feature. It would be nicer still if the user could define triggers for these workspaces, such as “change layout to the UI Designer workspace when the XAML or Windows Forms designers are opened”. Visual Studio and other development tools have traditionally been desktop applications. In Silverlight 4, however, we now have a framework sufficiently powerful to build a respectable cross-platform IDE. With features such as off-line, out-of-browser execution, full screen mode, custom context menus, and trusted access to the local file system, it’s now possible for a great IDE to be built and run on Windows, Mac OS X, or Linux, and to allow a developer to access the IDE and their solutions from any computer with a browser (and the Silverlight plug-in). There are already programming editors and compilers in the cloud. In episode 562 of .NET Rocks on teaching programming to kids, their guests point out that a subset of the Small Basic IDE is available in Silverlight. For those looking to build programming editors, ActiPro has a SyntaxEditor control in WPF that they’re currently porting to Silverlight (for which they report seeing a lot of demand). Ideally such an IDE would be free, or would have a free version available, but for those of us who need high-end tools and professional-level features sets, imagine how nice it would be to pay a monthly fee for access to an ever-evolving IDE service instead of having to cough up $1,100 or $5,500 (or more) every couple years. Not only would costs be conveniently amortized over the span of the tool’s use, but all of your personal preferences would be easily synchronized across all computers that you use to work on that IDE. With cloud computing services such as Windows Azure, it would even be possible to off-load compilation of large solutions to the cloud. Builds that took 30 minutes could be cut down to a few minutes or less by parallelizing build tasks across mutliple cores and servers. The era of cloud development tools is upon us. Solution Explorer is one of the most useful and important panels in Visual Studio. It provides us with an organizational tool for all the assets in our solution, and provides a window into the project system on which core behaviors such as builds are based. It is through the Solution Explorer that we typically add or remove files, and gain access to visual designers and the ever-present code editor. In many ways, however, Solution Explorer and the project system it represents are built on an old and tired design that hasn’t evolved much since its introduction over ten years ago. For example, it still isn’t possible to “add existing folder” and have that folder and all of its contents pulled into a project. If you’ve ever had to rebuild a project file and pull in a large number of files organized in many nested folders, you have a good idea of how painful an effort this can be. If you’ve ever tried sharing the same code across multiple incompatible platforms, between Full and Compact Framework, or between Silverlight 3 and Full Framework, you’ve likely run into kludgey workarounds like placing multiple project files in the same folder and including the same set of files, or using a tool like Project Linker. Reference management can also be unwieldy when you have many projects and references. How do you ensure you’re not accidentally referencing two different versions of the same assembly from two different projects? My article on Project Reference Oddness in VS2008, which explores the mysterious and indirect ways references work, is by far one of my most popular articles. I’m guessing that’s because so many people can relate to the complexity and confusion of managing these dependencies. In perhaps the most important example, consider how multiple projects are packaged for deployment, such as what happens for the sake of debugging. Which assemblies and other files are copied to the output directory before the program is executed? The answer, discussed in my Project Reference Oddness article, is that it depends. Files that are added to a project as “Content” don’t even become part of the assembly: they’re just passed through as a deployment command. A set of source code files that will get compiled, producing an assembly. A set of files that get embedded in the resulting assembly as resources. A set of deployment commands for loose files. A set of deployment commands for referenced assemblies. If a Visual Studio project were a class definition, we’d say it violated the Single Responsibility Principle. It’s trying to be too many things: both a definition for an assembly as well as a set of deployment commands. It’s this last goal that leads to all the confusion over references and deployment. Let’s examine the reason for this. A deployment definition is something that can span not only multiple assemblies, but also additional loose files. In order to debug my application, I need assemblies A, B, and C, as well as some loose files, to be copied to the output directory. Because there is no room for the deployment definition in the hierarchy visualized by Solution Explorer, however, I must somehow encode that information within the project definitions themselves. If assembly A references B, then Visual Studio infers that the output of B needs to be copied to A’s output directory when A is built. Since B references C, we can infer that the output of C needs to be copied to B’s output directory when B is built. Indirectly, then, C’s output will get dumped in A’s output directory, along with B’s output. What you end up with is a pipeline of files that shuffles things along from C to B to A. Hopefully, if all the reference properties are set correctly, this works as intended and the result is good. But the logic behind all of this is an implicit black box. There’s no transparency, so when things get complicated and something goes wrong, it can become impossible to figure it out in a reasonable amount of time (try reading through verbose build output sometime). At one point, just before writing the article on references mentioned above, I was spending 10 hours or more a week just fighting with reference dependencies. It was a huge mess, and a very expensive way to accomplish absolutely nothing in terms of providing value to customers. Considering our new perspective on the importance of representing deployments as first-class organizational items in solutions, let’s take a look at what that might look like in an IDE. Focus on the top-left of the screenshot below. The first level of darker text (“Silverlight Client” and “Cloud Services”) are equivalent to “solution folders” in Visual Studio. They’re labels that can be nested like folders for organizational purposes. Within each of these areas is a collection of Deployment definitions. The expanded deployment is for the Shell of our Silverlight application. The only child of this deployment is a location. In a desktop application, you might have multiple deployment locations, such as $AppDir$, $AppDir$\Data, or $UserDir$\AppName, each with child nodes representing content to be deployed to those locations. In Silverlight, however, it doesn’t make sense to deploy to a specific folder since that’s abstracted away from you. So for this example, the destination is Shell.XAP. You’ll notice that multiple assemblies are listed. If this were a web application, you might have a number of loose files as well, such as default.aspx or web.config. If such files were listed under that deployment, you could double-click one to open and edit in the editor on the right-hand side of the screen. The nice thing about this setup is the complete transparency: if a file is listed in a deployment path, you know if will be copied to the output directory before debugging begins. If it’s not listed, it won’t get deployed. It’s that simple. The next question you might have is: doesn’t this mean that I have a lot of extra work to manually add each of these assembly files? Especially when it comes to including the necessary references, nobody wants the additional burden of having to manually drag every needed reference into a deployment definition. This is pretty easy to deal with. When you add a reference to an assembly, and that referenced assembly isn’t in the .NET Framework (those are accessed via the GAC and therefore don’t need to be included), the IDE can add that assembly to the deployment definition for you. Additionally, it would be helpful if all referenced assemblies lit up (with a secondary highlight color) when a referencing assembly was selected in the list. That way, you’d be able to quickly figure out why each assembly was included in that deployment. And if you select an assembly that requires a missing assembly, the name of any missing assemblies should appear in a general status area. What we end up with is a more explicit and transparent way of dealing with deployment definitions separately from assembly definitions, a clean separation of concepts, and direct control over deployment behavior. Because deployment intent is specified explicitly, this would be a great starting point for installer technologies to plug into the IDE. In Visual Studio, a project maps many inputs to many outputs, and confuses deployment and assembly definitions. A Visual Studio “project” is essentially an “input” concept. In the approach I’ve outlined here, all definitions are “output” concepts; in other words, items in the proposed solution hierarchy are defined in terms of intended results. It’s always a good idea to “begin with the end in mind” this way. In the screenshot above, you’ll notice there’s a dropdown list called Solution View. The current view is Deployment; the other option is Assembly. The reason I’ve included two views is because the same assembly may appear in multiple deployments. If what you want is a list of unique assemblies, that alternative view should be available. In this article, we explored several features in modern IDEs (Visual Studio specifically), and some of the ways in which imaginative rethinking could bring substantial improvements to the developer experience. I have to wonder how quickly a large ship like Visual Studio (with 1.5 million lines of mostly C++ code) could turn and adapt to new ideas like this, or whether it makes sense to start fresh without all the burden of legacy. Though I have many more ideas to share, especially regarding the build system, multiple-language name resolution and refactoring, and IDE REPL tools, I will save all of that for future articles. If you’re unfamiliar with extension methods in C# or other languages, this section might blow your mind a little bit. If you love and use extension methods all the time, and don’t know what you’d do without it, my hope is that you enjoy the power that Archetype unleashes with robust type extensibility. Here we can say var result = “Hello there”.ShuffleLetters(); and the dot triggers Intellisense to pop up and show our ShuffleLetters method. Extension methods are great. But if you really embrace them and start thinking in terms of opportunities for extensions, you’ll run into a few brick walls. You see, extension methods are just a tease; they’re merely the tip of the iceberg, one isolated fragment of a larger (and seemingly happier) family. First you begin to wish you could add a property instead of a method so you don’t have to put up with parentheses or a Get- prefix to force a property to look and behave like a method. You might see distasteful expressions like cust.HasChanges(), and there’s nothing you can do about it. Then you’ll be working with a static class, and you’ll wish you could add a static method, but you can’t add static members. Eventually, you’ll run into that scenario where an additional operator or constructor would be the perfectly elegant way to solve the current problem. But you’ll resign yourself to something kludgy instead. So having gone down a similar road, I was more than a little frustrated when C# 4.0 was released with no new type extensibility at all. This is one of the stimulants to my starting the Archetype language project: the crystallization of knowledge that no other language team was likely to evolve in the direction and with the priorities that I’ve been developing in my head over the years. I’m beyond the point where I’m willing to just wait and see what happens. The method must be both public and static. The first method parameter’s type is the type to be extended. The first method parameter must be prefixed by the “this” keyword. This hints that we’re adding an instance member. The class the method is defined in must be both public and static. You would never guess these requirements, and it’s easy to get one of them wrong and skip a beat fixing it. Now try to add extensions for properties, operators, constructors and finalizers, indexers, and possibly fields, and then throw in static members. How will you designate all of these different things? Lots more cleverness, I’d say, but it’s not likely to be syntactically scalable. There’s a lot happening here, so let’s go over what we see here one step at a time. The original class we’re going to extend, Customer, is defined first. Two bindable properties and a constructor, nothing more. Creating a wrapper for a class extension doesn’t require that you remember several clever tricks. Instead, you simply write “ClassTarget extension”, and everything within the structure is considered an extension of that type. BirthDate is an extension property. FullName is also an extension property, however the composite keyword, combined with references to FirstName and LastName, requires that the Archetype compiler look at the target class as well as the extension class to resolve identifiers. The compiler must also wire the binding infrastructure so the target object stimulates the FullName property to update when either composite part does. Referenced members against the target class must be visible to an external class: private and protected members can’t be referenced from an extension, for example. The this method is an instance constructor. set all sets FirstName and LastName on the target object and BirthDate on the extension object. Constructor methods don’t require a return type, as they are assumed to be the same as the type they’re defined in. BuildCustomer is a static factory method. The assert keyword is a way to define checkpoints to ensure that conditions are what they’re expected to be, which are especially valuable at the beginning and end of methods. The basic idea is that you’d be able to define their behavior to throw an exception, log a message, or whatever you like when they’re violated: in debug mode, or in production code. More about this construct in a future article. Operators are also supported, but are not shown in this example. To see how custom operators are created, see Part 7 of this series for a detailed explanation. While extension methods are simple to implement in a compiler, extension fields are a little bit more complicated. In addition to this transformation, it is necessary to remove Dictionary entries that refer to objects that have been garbage collected, to prevent these dictionaries from growing uncontrollably. When one or more extension properties are used in an assembly, a background worker thread might occassionally check the keys in these dictionaries to see if any refer to garbage collected objects, and remove them. The BirthDate property would handle data binding and then call one of these two methods (or simply include their logic within the property get and set methods). Another possibility is to instantiate the internally-named extension class and use that as the value in a dictionary. A runtime mechanism tracks instances of extension objects and remove them from the dictionary periodically. System.WeakReference provides the mechanism to do this. It involves two WeakReferences per object: a short weak reference that becomes null and signals the need to cleanup, and a long weak reference to use as a key to the dictionary to clean up. This mechanism would be loaded only when necessary, and some configuration on its cleanup behavior will be made available. Static field and property storage would be easier to implement and wouldn’t require any cleanup. There are a few members that may not make sense to provide as extensions. Static constructors may provide some value to the extension class, but it wouldn’t be able to reach into the target object at static constructor runtime. Once the wrinkles of implementation detail are worked out, this rich ecosystem of type extensions will open up clean and elegant solutions for adding missing parts from types that you know belong there. “Another interesting pattern that I’m very fond of right now in terms of language evolution is this notion that our static languages, and our programming languages in general, are getting to be powerful enough, that with all of these things we’re picking up from functional programming languages and metaprogramming, that you can–in the language itself–build these little internal DSLs, where you use fluent interface style, and you dot together operators, and you have deferred execution… where you can, in a sense, create little mini languages, except for the syntax. If you look at parallel extensions for .NET, they have a Parallel.For, where you give the start and how many times you want to go around, and a lambda which is the body you want to execute. And boy, if you squint, that looks like a Parallel For statement. On one hand, I agree with him: the introduction of lambda expressions and extension methods can create some startling new syntax-like patterns of coding that simply weren’t feasible before. I’ve written articles demonstrating some of this, such as New Spin on Spawning Threads and especially The Visitor Design Pattern in C# 3.0. And he’s right: if you squint, it almost looks like new syntax. The problem is that programmers don’t want to squint at their code. As Chris Anderson has noted at the PDC and elsewhere, developers are very particular about how they want their code to look. This is one of the big reasons behind Oslo’s support for authoring textual DSLs with the new MGrammar language [now called M]. Ruby and Groovy also support closures that are supplied external to the method arguments. With this global function, I can write parallelized forking code as though it were a part of the Archetype language. With the Keyword attribute, I can even colorize the function name as if it were a built-in keyword. But the main reason to explicitly mark it as a closure is so it can be treated as an embedded statement, such that keywords like return and break behave within the context of the containing scope. In other words, if I use return within one of these closures, my intention is to return from the method that closure lives in, not to return out of the closure itself: that’s what the the break keyword is for. The it keyword above assumes the role of the single object in the collection specified (customers). This is starting to look pretty good, but the it keyword is a crutch if you think about it. We only need it because we don’t have something nicer like the expression I introduced in Part 3 of this series when I talked about iterating with loop. You may recall there were basically two formats for specifying the bounds and behavior of the loop. To make a custom control structure look and behave like one of the built-in variety, there must be a way to indicate in the parameter list that such an argument is required. So let’s say that we introduce an iterator keyword to indicate we want to support either of the syntaxes shown above. Now we can reference an identifier that makes sense to us, cust, and the whole thing looks like it’s baked into the language. Viola! There’s another kind of iterator that pertains to coroutines that I haven’t discussed yet, but in Archetype I call them streams, so there shouldn’t be too much confusion between them. One thing I haven’t mentioned yet is Archetype’s support for optional parameters. They work the same as in C# or VB.NET, and come in handy here. By making the second closure parameter optional (by adding “ = null ” after "closure as join”), we can now use fork alone, or fork-join together, in a single function definition. If we don’t enclose it in a specific namespace or class, it will look exactly like a language keyword. Another example was brought to my attention (in the comments for article 2). The idea is that a predicate is defined in a closure, syntactically separate from the argument list, inspired from the language Groovy. The curly braces—though fantastic for multiple-statement blocks of logic, is overkill for simple expressions (and so is the return keyword). Unless I uncover a good reason not to, I’m inclined to allow Archetype to trade the curly braces for parentheses for simple expressions. We could then write this, which is what I was ultimately looking for. I introduced the ShouldPrint boolean variable here to illustrate that the conditions provided here don’t have to relate to it (and in most cases, probably would not). You may be wondering if using if as the closure’s name would cause a problem with the if keyword in the Archetype language. The reason it’s not a problem is that it appears between the method name on the left and the semicolon on the right. After the semi-colon, the appearance of the if token would be mapped to the language keyword. The first closure parameter of a method can be named or nameless, but all subsequent closures must be named. I can’t think of a reason to limit the number of closure parameters other than too many is ridiculous, but I’ll leave that to the discretion of the Archetype developer. Closure parameters can be defined with params for chaining together arbitrary numbers of named closures. When calling a method with no parameters except closures, the parentheses after the function name can be omitted. These methods will be exposed to other languages as having delegate types as well as Iterator and Closure attributes to identify those parameters. Another possibility arises when you consider that the if clause added to the print method could be defined in such a way that it could be applied to any method invocation. I’m not advocating this particular pattern of placing the if condition after the statement to execute, but it will do for the sake of illustration. This feature is purely speculative and I’d be curious to hear some feedback. One line deserves explanation: name is defined as a string variable regardless of the if clause; it is ReadLine which is executed or not based on the condition specified. More interesting examples are possible if we leave the world of expression closures and consider multiple-statement closures. One possibility involves adding an async closure extension clause, with the callback handled by the supplied closure. There are many possibilities here, as this opens up the doors to syntax experimentation without actually having to modify the language grammar itself. This is very similar to macros in languages like Lisp and Nemerle. On one hand, it’s more constrained to ensure that each extensibility point always conforms to a common set of structural principles, but the variety of structural extensibility points make it extremely versatile. I have a few more ideas for language extensions (or “syntactic sugar shaping”) for other types of clauses (we only covered method invocation here), but I’m going to save that for another article. This article took some long strides toward defining how Archetype handles type and language extensibility, positioning Archetype as an incredibly flexible and malleable tool with which to define syntactic patterns for solving entire classes of problems more intuitively and elegantly. I created a CodePlex project for Archetype to give it a home. Over the past few weeks, I’ve created a C# 4.0 parser using the M language to prepare me for the construction of Archetype’s parser and compiler. The C# parser definition is available for download on the CodePlex site. If you’re curious about how languages are parsed and projected into Abstract Syntax Trees (ASTs), download this and open it in Intellipad. You can download Intellipad for free at this Microsoft site. Once you’ve opened it in Intellipad, find where it says “M Mode” in the upper-right corner. Click that, and select DSL Grammar Mode. Then open the DSL menu and select “Split New Input and Output Views”. You’ll see three window panes. On the left, you can enter or paste in some C# code. The middle contains the C# grammar. On the right, you’ll see a graph of objects that represents how the parser views your code. It’s pretty interesting to see what it comes up with! My next steps involve cleaning up the Unicode character class issues in the grammar, and then getting it to build an object-graph in memory based on the M Graph (the contents of the right window pane). After that, I can work on generating C# code from that AST. I’ll end up with a C# to C# converter, which seems silly, but I’ll eventually fork the M grammar into its own Archetype grammar and start to change the parser to accomodate the new language. The output will remain C#, since that’s easy to compile to assemblies with the csc.exe compiler, but the input will be the new goodness of Archetype. Future articles will detail this work, as well as defining new corners of Archetype language syntax. The if statement has been a classic across so many languages. In Archetype it is almost identical to C# syntax. In Archetype, the exclamation point can be placed before the parentheses. It is the only part of the condition that can appear outside the parentheses. C-style languages have supported a language construct, switch-case, for providing access to simple jump tables combined with a syntax that is better suited than if for matching many conditions. This has been unfortunately limited to matching against value types (and string in C#) and against constant values at that. It’s unfortunate because the more concise syntax for multiple matching values is good in itself, not only when the matching values are constant values. This constraint is due to the way those compilers build jump tables; it’s a performance optimization technique designed during a time when 8 MHz processors were considered fast. Pattern matching is one area where functional languages have been very strong. Archetype has a match keyword that serves the purpose. In this example, both LetsBegin and AddIdentifier would be called. Archetype also supports regular expression literals based on the syntax from Microsoft’s M language as a result of list syntax and operator overloads defined as a library. In many scenarios, Archetype can determine the difference between string and regular expression literals. However, in simple cases such as matching against a single character or simple string of characters, the variable defined will require the specification of the regex type. The range of letters and the * Kleene operator (which means repeat 0 or more times) identifies MyRegEx as a regex identifier. Let’s take a look at how regular expressions and regular expression literals work with the match construct. First we see the literal embedded directly in the match statement, as the only value to match against. Next, we’ll look at how we can define the regex objects and use their identifiers. In this way, we can build up libraries of interdependent regular expressions and go even so far as to write sophisticated parsers. This is an important tool for fulfilling the goal of language-oriented development. Finally, you can apply a when clause as a pattern matching guard similar to F#. This isn’t the last word on pattern matching or regular expressions in Archetype. This is one area I expect to evolve and grow, and to appear in future articles. Archetype is a multi-paradigm language, as most commonly-used languages are today. While it has many features which are functional, it’s heavily influenced by object-oriented design ideas. Most object-oriented languages are largely imperative rather than functional. That is to say, it is “programming by side-effects” rather than the goal in functional programming of “no side-effects” (or as few as possible). Functional programming has grown in popularity relatively recently, considering it’s been around from the beginning of high-level language design. However, it suffers in some areas such as representing stateful behavior in user interfaces. Some clever solutions have been devised (such as the use of monads to trick or fake the logic into representing state in a purely functional way), but the theory and application of these patterns are far from intuitive. I believe this is largely the reason why functional programming languages have been the niche speciality of scientists and mathematicians and not your every day developer. Because of these contentious forces, Archetype is aimed at being a transitional language: urging us forward in the use of functional patterns, but without abandoning the imperative style of “programming by side-effects”, and striving to look familiar to programmers of imperative languages such as C#, Visual Basic, etc. There are some built-in Archetype constructs that will help to make object-oriented programming safer. While it doesn’t propose, like Axum (previously code-named Maestro), to prevent any logic that is unsafe in a concurrent execution environment, it does provide some simple but powerful tools that can be used to reduce the risk considerably. I’m referring primarily to agents which support the Software Agent or Actor Model of parallel program design. Agents are special classes that run independently (in parallel) of each other, and can only communicate with other agents through messages (introduced in part 3). Specifically, agents are not allowed to call the methods or subscribe to the delegate members of other agents. Since each agent runs without the ability to receive from or give execution control to other agents, there is much smaller chance of coordination problems while executing concurrently. In every other way, however, agents are defined and composed just like classes. First, we’ll take a look at a simple Customer class. The class name appears first, followed by a required base type (object here), and a list of interfaces separated by commas. Archetype supports single-class inheritance with the ability to implement any number of interfaces (or traits, more about that later in this article), as well as any generic type parameters and generic type constraints that you’re used to. With many parameters in a constructor (or another method), this can save many lines of typing. If you only want to store some of the parameters in properties, you can use a comma separated list: set FirstName, LastName. If your intent is to set all parameters, you can use the abbreviated set all instead, as shown in the example. When set all is used, specifying parameter types is optional. The following code provides an example of two agents that cooperate with each other. I have more ideas for actor-based programming (such as a built-in RequestID: me.id), but I want to start simple and force myself to work hard to justify any overhead. Composing classes together to obtain maximum reuse of code has been a goal of object-oriented programming for a long time, but it usually falls short of the ideal. Languages like C++ that support multiple inheritance are unwieldy due to the additional complexity (see the Diamond Problem), and single inheritance—though sufficient in most scenarios—suffers from limitations that have bothered OOP programmers from the beginning of programming time. Other languages have introduced constructs like Flavors and Mixins, and each has had to deal with its own peculiarities and workarounds. While an in-depth discussion of traits and their advantages over other approaches is beyond the scope of this article, a smart group at the OGI School of Science & Engineering published a paper that illustrates the issues clearly. In it, they explain how traits solve many of the problems while avoiding the pitfalls of other approaches. Although multiple inheritance makes it possible to reuse any desired set of classes, a class is frequently not the most appropriate element to reuse. This is because classes play two competing roles. A class has a primary role as a generator of instances: it must therefore be complete. But as a unit of reuse, a class should be small. These properties often conflict. Furthermore, the role of classes as instance generators requires that each class have a unique place in the class hierarchy, whereas units of reuse should be applicable at arbitrary places. The basic idea is that a trait defines a set of functions but no state. Multiple traits are pulled into a class, where they are “flattened”. This means that each trait’s functions are added to the class as if those functions were defined directly in the class. That is, you don’t need to use a member access operator (.) to navigate from the class to the trait and then to the trait’s function. In doing this, it’s possible for function names and signatures to overlap among traits. If the name is the same but the signature is different, they’re applied as overloads. When there’s an actual clash, a conflict-resolution expression is defined to specify the function to use (or ignore). This is an experimental area of the Archetype language, one that will likely change several times before getting right. Here’s an example of what it will probably look like to compose classes out of traits. The type parameter on the trait allows you to constrain the types of object to which the trait can be applied. The where T : ref is the same as where T : class in C#. The require and provide keywords specify the methods that trait requires to be present, or provides to the host class. Archetype may also support a require of an entire trait, which would act analogously to subtyping (or rather, more like an #include). Conflict resolution expressions aren’t shown because their syntax hasn’t yet been decided. Code formatting applies an italic font to traits, but maintains the color of a user-defined type. This should help to avoid confusing traits with classes. This is only one possible solution, but it suggests the use of multiple ways of categorizing identifiers to apply a mixture of formatting and colorizing behaviors. This is not a great example of the strength of traits. I’ve also had some design ideas for runtime mixing of traits into classes, while still accessing everything through strongly-typed variables (think of traits as interfaces), but this will require much more exploration. Another idea to support some Aspect Oriented feature. Imagine if you could define a trait called Bindable, that when added to a class, would add the bindable type extension modifier to all of its properties. For better examples of traits and class composition using traits, I recommend reading the above-mentioned paper. In this article, I covered simple conditional statements as well as functional-style pattern matching. We also looked at agent-based programming based on loosely-coupled messages, which provides greater safety in parallel programming scenarios, traits as a way to compose features on a more granular level and to solve the composition problems that plague single-inheritance languages. My next article will cover extension of types (extension methods, properties, events, indexers, constructors, and operators), as well as the first of language extensibility options (defining new control structures). I will probably dip out of sight for a few weeks as I get further along in building the parser and compiler, and learn about Visual Studio’s Managed Language Services. If you don’t already follow me on twitter (@danvanderboom), I do a lot of tweeting about what I’m reading, researching, or considering during the language design process, so this is a good way to get an inside look at that process. The try keyword can be used within any code block. You’ll see this pattern appear in other constructs in Archetype (such as async blocks). The exception type can be specified by itself (without a name), and the default variable "ex" will be used. If a catch block doesn’t specify an exception type, Exception is presumed. The order of catch blocks must be from most derived to most base (Exception itself must always be last, if present). Incorrect ordering will result in a compiler error. Catch and finally blocks are scoped as nested within the try block. This enables catch and finally blocks to reference identifiers defined in the try block. As with C#, the throw keyword can be used with an Exception variable to wrap and rethrow a caught exception, or throw can be used to in a statement by itself to rethrow the original exception. In Part 2, we saw the first of the import keyword to import namespaces. Like Nemerle, we can also apply the import keyword with classes to access static members without specifying the class name. Another option is to import a namespace or class into a nested function or class scope. Similar to the with keyword in Pascal, import can be used to import a namespace or class for a specific code block. This limits a namespace or class import to a limited section of a function. One final thing you can do with import is to specify a namespace alias. The section on namespace imports above introduced namespace aliasing. In this section, we’ll see how to use the alias keyword to provide additional identifiers to classes, functions, properties, and fields. In addition to the alias statement, I’m introducing object instantiation syntax in Nemerle. The constructor of the Geneology.Child class is being called (via its alias, kid) with the new keyword but no parentheses, which are optional when calling a parameterless constructor. The var keyword is also new here. It is similar to the var keyword in C#, except that it’s required for local variable definitions. This example demonstrates alias used for a local variable. The syntax is identical for class fields and properties, except that those aliases can be specified at the class level as well as within functions. This last alias example shows how it can be applied to functions. We’ve already discussed exception handling, which is a very fundamental kind of control flow structure. In this section, we’ll explore several other constructs that are familiar to every programmer. In Programming Language Pragmatics, the author (Michael L. Scott) enumerates six essential types of control flow: sequencing, iteration, selection, exception handling, recursion, and concurrency. We’ll cover most of them in this article. Sequencing is merely the scheduling of one statement to be executed after another. This is the standard model of interpreting source code statements in a code block, so there’s not much more to say about it. Iteration is much more interesting. In Archetype, there are four iteration constructs. The first is the incredibly versatile loop. It can take a simple integer expression to loop a specific number of times. It can alternatively take an expression that introduces a variable, a range of values, and an optional skip value (similar to the for keyword in Visual Basic). Finally, it can act like the foreach keyword in C# and iterate over IEnumerable and IEnumerable<T> collections such as streams, lists, etc. This replaces the archaic syntax of the for loop in C# and older C-style languages, and provides a construct which is much easier to read and write. Each of the integer constants in the examples above can be replaced with expressions (variables, function calls returning integers, etc). When writing a loop, it’s often necessary to skip the remainder of the current iteration and continue with the next one. In C#, the ambiguous-sounding continue keyword is used. I remember seeing this for the first time and thinking that it meant to continue executing after the loop, which wasn’t the case. So in Archetype, I’m ressurrecting the venerable old keyword next, as in “go to the next iteration in this loop”. To break out of a loop altogether and continue executing after the loop, the break is used. A potent addition to the loop construct is the fork-join pattern. The fork and join words are actually defined in a library, not in the language itself. In a later article, you will see how to create patterns like this. The join clause’s parameter, named tasks in the example, is a reference to a list of Task Parallel Library (TPL) tasks. This is a handy way to execute code in parallel without having to restructure your code (similar to the Parallel.ForEach method in the TPL). Most of the difficulties of concurrent programming are matters of coordination, however, and so they are often best handled by parallel libraries such as the TPL or the Concurrency & Coordination Runtime (CCR). The next example is the familiar while loop. It matches a condition at the beginning of each iteration and only executes the following code block if the expression provided is true. The until loop works similarly, but tests its condition after the following code. Although it makes sense in C# that the until clause should appear at the end, where it’s placed, the reality is that in C# the syntax is awkward: I don’t know whether to keep my curly braces aligned and put the do and until on their own lines so they don’t crowd the embedded code block, or what. With the naming difference in Archetype, and with the debugger’s help in stepping through in the correct way, I’m betting this feature will not only be easy to grasp, but hopefully will be seen to clean up certain coding situations and help make looping syntax more structurally consistent. The break and next keywords apply to while and until loops as it does for loop constructs (see the Loop section above). It’s becoming more common now to make asynchronous calls to web services and other long-running processes that we don’t want our code to sit around waiting for. In Silverlight, for example, the only network communication options we have are asynchronous. But the Asynchronous Programming Model (APM) has a way of confusing and tripping up developers as they try to wrap their heads around it. Archetype introduces a few language constructs to make asynchronous programming easy. The async keyword allows you to call any method or delegate asynchronously with the same syntax. All of the details of dealing with AsyncCallback and IAsyncResult are abstracted away. The value keyword represents the return value of the asynchronously-called method (if applicable). The first access of value may result in an exception in the event that the target method failed when it ran. This can be caught with a standard try-catch block, or the following syntax can be used. All of the standard rules apply regarding the syntax of catch and finally blocks (see the Exception Handling section above in this article). As another reminder of the optional curly braces for single statements, here is a short and simple async call example. The ability to specify your intent to call methods and delegates asynchronously without mucking around in the implementation details should go a long way to making developers more productive in high-latency scenarios. In a final example of async, I’ll demonstrate how we can still obtain access to the IAsyncResult variable that is returned by the APM, which is useful if you need to occasionally check if it’s completed. Messages offer an alternative to delegates. As useful and simple as delegates are, the problem with them is that they pass along not only data, but also execution control. Often what we need, in particular for applications that must take advantage of parallel execution, is a way to pass along data without giving up control over execution. This is usually done by pushing a message onto a queue which can be picked up at the receiver’s convenience without holding up the sender. In Archetype, messages fulfill this need. Like delegates, they can be named or anonymous. Here is an example of each. Unlike their delegate counterparts, messages don’t have return values. Return values only make sense when you make a synchronous call and give up execution control. Though we can get around this with the async construct and the Asynchronous Programming Model, this is something of a hack. In the example above, the anonymous message provides the keyword message in place of a return type. In both cases, the out keyword is used to indicate that it is an outgoing message. As you might expect, there is an in keyword to indicate incoming messages. Messages are one way communications. If you need a response, you need to specify a corresponding incoming message. This applies to the communication of error information as well. If you’re interested in learning more about asynchronous message-based communication, you can refer to my article on the subject. The out messages act like delegates and can be called like functions, and you can think of in messages as event handlers, although they can also be invoked like methods within the agent. I am in the process of evaluating Axum and other agent-based languages. I’m particularly interested in the way Axum defines protocol contracts, which are compile-time checks that message A is responded to by message B, and so on. It’s likely that this type of constraint will be implemented using the language extensibility capabilities of Archetype, and that it will be deferred until I understand the issues and challenges better. Until that time, I believe that having the option to define messages as first-class members will provide developers with a greatly-needed tool for safer concurrency programming. It will make the execution control model explicit and obvious at member definition instead of being bolted-on later as a set of imperative instructions in an often-misunderstood corner of the .NET Framework. Another avenue I’m exploring is a syntax for exposing messages as WCF endpoints. Stay tuned for more information on this subject. We covered a lot of ground in this article. In these first three articles, many of Archetype’s most fundamental and important constructs have been explained and demonstrated. In the next article, I’ll introduce Archetype’s capabilities and syntax for conditional selection (if), pattern matching (including a much-needed replacement for the switch statement), and the relationship between traits and classes. There’s a lot more to see, but since this article turned out to be so large, I’ll stop here with promises about the next one. I don’t need it. There are plenty of perfectly usable languages out there. That being said, I want it. I want to spend a lot less time with ceremony and more with substance. I want greater expressive power without sacrificing readability. I want to extend the language syntax and hook into the compiler at certain key points to experiment with new ideas without having to version the base compiler. I want to define traits as composable types and reserve classes for engines of instantiation when it makes sense to do so. I want common concurrency patterns to feel like first-class citizens so that behavior guaranties can be made at compile time. I also want to see if all the language ideas I’ve come up with over the years will really be as valuable as I think they will be. I have a lot more reasons, too. They’ll be the subject of continued articles in the series. I would be remiss if I didn’t include a Hello World example. This is a complete program. It defines a Start function as a top-level construct (not inside of a class), with a single call to Console.WriteLine, a normal .NET method. C# already allows this with constructs like if, while, and for. Archetype takes it to the next level by making it universal. Requiring the start method of a program to be hosted in a class seems like a kludge to me; and in the spirit of enabling the language to be used for more functional programming, I thought it appropriate to allow this type of functional composition without the ceremony of an enclosing class. The startup function name will be Start by default, and a modifiable setting on the project options page will let you use a different name for the entry point function. It will also support using a static function in a class. First, we’re introducing the import statement. Our use of it here is identical to the using keyword in C#. The import statement does some other interesting things, which we’ll see in a future article. The first statement in our Start method defines a delegate called ShowInfo. Note that the only difference between this and a function definition is its lack of a trailing code block. Instead, a semicolon appears after the (empty) parameter list. The next line invokes the delegate. In C# this would throw a NullReferenceException, which I’ve always found annoying. In Archetype, as with Visual Basic, this gets converted by the compiler into a check for null followed by an invocation if it’s not null. I’ve gone this route because of how rare it is that I actually want to throw an exception in these cases; in C#, I’m constantly writing the null check for delegates to avoid it, wrapping that check and the invocation in OnDoWhatever methods, and that seems wasteful. In Archetype, if you want to throw an exception when a delegate is null, then write the code to throw one explicitly. The following two lines point the delegate to a specific function (expressed as a lambda, similar to C#) and add a lambda function to the first. The =, +=, and –= operators work as expected with delegates. Notice that the first lamda function supplies an empty parameter list, but the second one omits it. The parameter list can be omitted when there are no parameters, or when you don’t need to reference the arguments that are passed in. The first line is a valid delegate assignment. The intention of the second is :“each time ShowInfo is invoked, set Age to 1.” However, the parser reads this as “Set Age to 1, then set ShowInfo to Age,” which is not what we want. As a result, single assignment statement delegates in Archetype require being surrounded in curly braces. Finally in our Start method above, the last line invokes the delegate again, which in turn calls both lambda functions. The me keyword refers to the current function, Start. As the comments suggest, me.Name returns “Start” and me.Type returns a System.Void Type object. Calling me() as a function would call Start recursively. String concatenation doesn’t use the + operator. Multiple strings separated by spaces are concatenated automatically. In the case of Console.WriteLine above, where a string literal (“Type: ") is followed by a non-string value (me.Type), the non-string value is converted to a string with ToString. This can occur because the non-string value is listed where a string is expected. So far we’ve only seen anonymous delegate types. The ShowInfo delegate above has a type, but we can’t refer to it by name, and so we can’t share that type with other code. This is fine in many cases. In fact, many times I’m annoyed by the need to go to another file to add a delegate that will never be used elsewhere. But there’s also occassionally a need to expose that type, especially for use by a library or framework consumer. The following code defines a delegate type, a function that uses that delegate type for its parameter, and a call to the function. That call contains a lambda expression that creates an anonymous function and a delegate object pointing to it, and passes that to the ShowInfo function. Another way to think about this is that the delegate keyword simply defines a name (ShowPersonDelegate), which then points to an otherwise-anonymous delegate type: void(Name string, Age int). The final statement calls ShowInfo, passing in a lambda function, which has the same syntax as C#. For the sake of comparison, here is the same program using an anonymous delegate. Note that the delegate’s parameter names are optional. After being warned about the potential dangers of INotifyPropertyChanged by Michael in the comments of the previous article, I am exploring alternative implementations. Regardless of how it’s implemented (see Part 7 for more details), bindable will be a powerful addition to Archetype developers. When the compiler sees the composite keyword after get, it scans the following expression tree. When it finds property references and those properties are marked as bindable, it makes the appropriate transformations to notify of changes. In the underlying implementation, it is a push model, but the developer of Archetype is spared those details. Multiple-statement get functions are supported, and set functions are also supported when using composite. Binding to collections is a little different from binding to single properties. In WPF, Silverlight, and now more broadly in .NET 4.0, types such as ObservableCollection provide several notifications to user interface controls. Archetype provides special binding expressions to specify common scenarios such as “bind x to the selected item of this collection”. SelectedOptions is an ObservableCollection so that its subselection of contents can itself be bound to a user interface control. The bind to expression sets the binding source, and the where expression specifies a predicate (a function taking “item”, in this case an Option object, as a parameter, and returning a bool) to include only the objects we want. The where expression is optional. You may notice that SelectedItem and SelectedItems are not valid properties of ObservableCollection. This is because they are extension properties. Archetype supports extension methods just like C#, but it goes further to provide extension properties, indexers, constructors, and operators. I’ll discuss type extensions in a future article. What this doesn’t address is the possibility of binding a collection to more than one user interface control, and allowing independent selection in each. Because of this, the specifics of binding expressions in Archetype will very likely change before being finalized, but this should give you a taste of the possibilities of language-aware binding. In the next article, we’ll take a closer look at the import keyword and its special abilities, exception handling, local variable definition, and control flow structures such as if, loop, while, and until. I’ll also introduce one of my favorite Archetype features, the async construct which is used to intuitively call delegates asynchronously. After 25 years of computer programming in many different languages and a more-than-casual interest in linguistic analysis, I’ve developed a keen appreciation of the best features among them. I also have a relatively steady stream of new language feature ideas. Many years ago I began tinkering with interpreters and compilers. At PDC 2009, I was surprised and delighted to hear the news of the language M (part of Oslo), with which it is possible to write parsers for other languages. Parser generators have been around for a long time, but with such strong support in .NET, it was close enough to home for me to sit up and pay close attention. The desire to create my own language to address the shortcomings I’ve experienced has been perpetually in the back of my mind. After that PDC, I bought several more books on language and compiler design and began diving in. I’ve been somewhat obsessed with it recently, and the language specification I’m writing is starting to look legitimate, so I think it’s time to start sharing what I’ve come up with and (hopefully) get some good feedback. The code name for this language is Archetype. I don’t know if I’ll use this for the final name, but this will do for now. It’s a multi-paradigm language instead of attempting to be pure in any one way, and if you’re familiar with C#, you should be pretty comfortable with the syntax. Yet, if you enjoy the functional programming power of languages like ML, Haskell, OCaml, F#, or Nemerle, or are interested in language constructs to simplify asynchronous and concurrent workflows, you’ll probably like Archetype. While it supports functional programming, one of my goals is to make it appealing and even obvious to developers without a strong functional programming background. It targets the .NET CLR and will therefore run on many platforms and devices, as well as interoperating well with existing .NET assemblies. To place it in a set of buckets, as languages are classified by paradigm on Wikipedia, Archetype would be considered: imperative, declarative, generic, functional, object-oriented (class-based), language-oriented, reflective, and meta-programming-based. 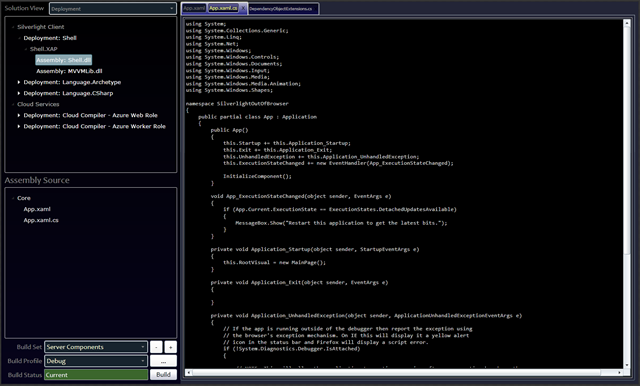 The parser is under development using M (in the Intellipad editor). Though the language design and specification itself is about 70-80% complete, the parser is only about 10% done. Once the parser is a little further along and some interesting samples can be written and parsed, I’ll start building the semantic analyzer and code generation pieces. The first versions of the compiler will generate C# code instead of IL instructions. It will be a lot faster for me to translate Archetype constructs to C#. The C# compiler, though not concurrent or incremental, is highly optimized and produces great output. This does limit my ability to depart radically from C# semantics, but this is okay: C# is a wonderful language and I plan to keep Archetype pretty closely aligned with it. For example: all of the same operators and precedence rules are borrowed from C#. Archetype does introduce a number of new operators, keywords, and syntactical constructs, but it aims to be close to a superset as far as semantics go. Everything is subject to change. Some features are stolen directly from specific languages which I will do my best to identify as I go. Your mileage may vary. Available while quantities last. Batteries not included. This is a set of experiments. Hopefully it will also be a fun conversation among language enthusiasts. Since this article is already getting long and I have a ton designed already, I’m going to keep the language design part short and present a mere taste of language features. We’ll start with something basic: how to define properties and fields. This first example is a property. The name comes first, which you’ll see everywhere in Archetype. Also notice that the int type is the same as in C#. This is true of all the built-in C# types. To define a field, the “field” keyword is added before the type. This encourages property definition by default. When defining properties, it’s so common to require a private “backing field” that I thought it warranted something in the language. C# also does this, but only if you use implicit get and set functions. As soon as you need custom logic for one or the other, you lose this. In Archetype, the “me” keyword refers to the current function or property. In the case of properties, me.Value is the backing field which saves you a line of code for every property that needs one. Reducing code clutter and maximizing information density and conciseness are major design goals in Archetype. Other “me” properties are available as well, such as Name and Type, which are useful for general-purpose code generation and debugging. In functions, invoking “me” is recursive. C# has the keyword “this” (which Archetype shares), which very usefully refers to the current object. The “me” keyword is roughly analogous to this.GetType(). Note the lack of a "return" keyword in the get method: “get return” would be redundant. Also, the get and set clauses are separated by a comma. This is a common pattern for multiple clauses in Archetype. The semicolon triggers the end of the statement (in this case, a property declaration statement). Public class variables are properties by default to promote consistent and forward-looking design techniques (such as compatibility with interfaces), and the field keyword is there to opt out when there is a need (such as performance). Value types in this language are not nullable by default. The question mark can be used after the value type’s name to indicate it is nullable. I’ll have much more to say about functions and delegates in my next article. Here, I’ll just briefly sketch an outline of what they look like and hint at what’s to come. As with properties, the identifier is listed first (along with a generic type parameter), followed by the return type, and finally the parameters in parentheses. I’ve been comfortable with the type-first definitions in C# for years, but I’ve often begun writing a function whose name came to mind instantly, but whose return type required further thought. However, my fingers would hesitate to type anything until I could determine the return type. After seeing the name come first in Nemerle, it struck me how nice it would be to define functions name-first. The problem that Nemerle has (and Visual Basic, for that matter) is that the parameter list comes next, and the return type is listed last. This has the advantage that it’s easier to write, but suffers from being more difficult to read. When doing a quick scan of code, eyes scanning down through a class, the return types will be all over the place on the screen. In the case of long parameter lists where poorly-formatted code puts the return type off the screen too far to the right, you’d actually have to scroll right to see the return type. This is decidedly worse than type-first. Then I thought: why not put the two most important parts of a function header first: name and return type, with parameters after them? Then you’d have the best of both worlds: faster to write, and easy to read and understand. Each parameter then follows the “name type” order, consistent with properties and functions. In my next article on Archetype, I’ll go into much more detail about functions and delegates, where I think Archetype makes some original contributions (at least in terms of syntactical convenience and elegance). I’ll talk about creating basic console applications, the simplest program possible to write, anonymous functions and anonymous delegates, a keyword (actually a custom type extension) to drastically simplify data-bindable property definitions for UI view models, and more. [Updated 8/14/2014] The source code for this library can be found here at GitHub. Also check out my blog post announcing it. This is an update to my original article on a non-binary tree data structure. After receiving multiple requests to complete this, here it is. The updated source code can be downloaded here. To illustrate the four possible traversal types, the following tree data structure will be used in all of my examples. The enum TreeTraversalType has two possible values: DepthFirst and BreadthFirst. The other enum involved, TreeTraversalDirection, determines which end of the tree it starts from: TopDown or BottomUp. There are four possible combinations of these two values, which will each be presented separately. This traversal strategy involves starting at the root and digging as deep into the tree whenever possible. The order of nodes yielded by our example tree structure would be a-b-d-e-c-f-g.
Because we’re moving bottom-up in this case, the first thing we have to do is dive to the bottom of the first branch we find. We skip past a and b, and find d with no children. D is therefore the first node we’ll yield. E is it’s peer, so that comes next. From e, we move up the tree to b. A is the root, so it has to be the last node yielded, so we’re going to dive into the c branch next, yield f and g, and then yield c and finally a. The order is: d-e-b-f-g-c-a. When we traverse breadth-first, we’re moving through the tree in levels. With Top-Down, we start with the root a, then move to the second level with b and c, and then finally move to the third level to yield d-e-f-g. The final traversal is the one I had the most trouble with, and I ended up cheating a little by reversing the Breadth-First, Top-Down traversal. ADO.NET Data Services is a rapidly evolving set of tools that provides data access to remote clients through a set of REST-based services. The Data Services Client Library for .NET performs the magic of translating your Linq queries to URLs and passing them to the data service back-end, as well as retrieving results and hydrating objects in the client to represent them. After running into a number of problems with the current CTP of RIA Services (see my article), I decided to fall back on Data Services to provide data access in my newest project. Data Services has the advantage of allowing you to write fairly normal Linq queries against Entity Framework entity sets, and entity data models can reside in a dedicated data model assembly (instead of requiring them to be part of the web project). This forces us to adopt some new patterns for data access. This isn’t a bad thing, however. And it’s an inevitable transition we’re making to asynchronous, concurrent program logic. When using a lambda statement for brevity, the syntax isn’t too bad, but the pattern gets a little more involved when you include error handling logic. If EndExecute fails, you’ll need the ability to perform some compensating action. So what I’ve done to keep my client code simple is to define an extension method called AssignAsync that encapsulates this whole pattern. In other words: if the query succeeds, assign the result to the properties collection; if it fails, send the exception object to Debug output. Either action can be used to send signals to other parts of your application that will respond appropriately. Instead of Debug.WriteLine, you might add the exception object to some collection that triggers an error dialog to appear and your logging framework to record the event. Instead of assigning the result to a simple collection, you could convert it to an ObservableCollection and assign it to an ItemsControl in WPF or Silverlight. Anything is possible. As I explore Data Services further, I will be looking for ways to share query and other model-centric logic between Silverlight and non-Silverlight clients. I suspect that the same asynchronous patterns can be used in non-Silverlight projects as well, and that those projects will benefit from this query style.